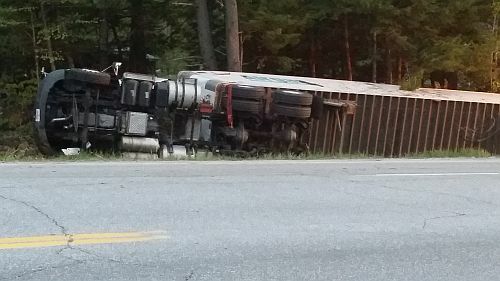 A tractor trailer accident had the westbound lane of Rte 11 in Georges Mills closed for several hours yesterday afternoon. Sunapee Fire Chief Dan Ruggles said the accident happened about 1:00 pm and involved some environmental cleanup. The Chief said the department returned to the scene shortly after 7 pm. No one was injured in the single vehicle crash and cause of the accident is still under investigation. Representatives from the Airgas Company were on scene and did not want comment. A video of the truck being up righted is on the WNTK’s facebook page. This entry was posted in accident, Fire Department, news, NH on May 19, 2016 by GrowingInArt.